Founded in 1998, FatCow is an oldie that, in 2008, made a leap into the future and now is powered 100 percent by wind. It‘s nice to contribute to a greener environment, especially if your mascot is an animal that grazes out in nature. You’ll have a laugh browsing through their pages because they are filled with puns about cows and dairy. But is their service udderly fantastic, or has this particular product gone a bit sour? When it comes to hosting plans, there aren’t many options. And, you’ll have to read their usage policy carefully, because unlimited isn’t really unlimited. The original FatCow plan gives you unlimited disk space and bandwidth, and one free domain (although you can purchase as many domains as you want). VPS hosting has three plans. The Basic plan gives you 1-Core CPU, 1GB RAM, 40GB disk space, 1TB bandwidth and one IP address. Business includes 2-Core CPU, 4GB RAM, 90GB disk space, 3TB bandwidth and two IP addresses. Optimum provides 4-Core CPU, 8GB RAM, 120GB disk space, 4TB bandwidth and two IP addresses. Dedicated hosting also offers three plans. Startup gives you 2 Intel Xeon E3 – 1220LV2 3.5 GHZ cores, 4GB RAM, 500GB of disk space, 5TB bandwidth and three IP addresses. Professional provides 4 Intel Xeon E3-1265LV2 3.2 GHZ cores, 8GB RAM, 1000GB of disk space, 10TB bandwidth and four IP addresses. Enterprise plan will give you 4 Intel Xeon E3-1230V2 3.7 GHZ cores, 16GB RAM, 1000GB of disk space, 15TB bandwidth and five IP addresses. WordPress hosting is available in two packages. WP Starter includes unlimited bandwidth and disk space, and one free domain. WP Essential provides unlimited bandwidth and disk space, and one free domain. It also will give you super speed, enhanced security and support from WP experts. Sign up and login are standard: just provide your username, password and payment method. You can choose payment terms from one month up to three years. After you’ve completed this process, basic information about your hosting account and purchase will be sent to you via email. With most services, you have some sort of customer portal and control panel. This not the case with FatCow. When you log in, you’ll find that everything is in one place. Since security isn’t an issue, it’s nice to have one less login. We get into the details of the control panel later, but the really practical thing is to have My Favorites prominent. They update as you use them, so you don’t have to be constantly scrolling. If you didn’t catch it during registration, note that you’ll get 1GB of free cloud storage. It’s always nice to see integration with other services, but when it’s Google, it’s simply fantastic. Google Analytics is just a couple a clicks away, and if you want to use the rest of their apps, you can do so for only $5 a month. You‘ll also receive advertising credits and additional tools like .htaccess Editor and Comodo DNS, so there are different ways to up your game. 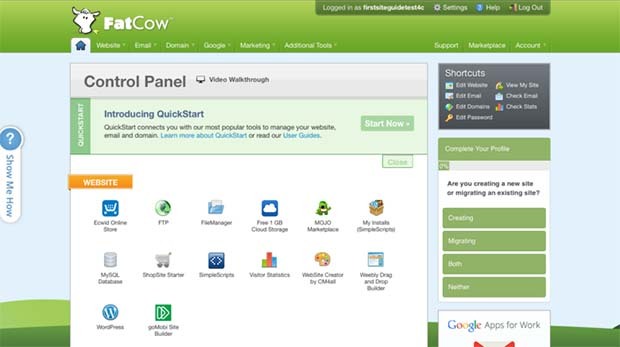 FatCow has a customized control panel that may look different, but you should find it relatively easy to use. Most everything you need can be accessed from tabs at the top of the screen or you can scroll down and find the icons. The sections are: Website, Email, Domain, Google, Marketing and Additional Tools. In the Google section, you’ll be linked to numerous Google tools, from free Analytics to paid Gmail, Drive, etc. On your right, you’ll see shortcuts and access to Support, Marketplace and Account. Also on the right are the statistics for your system, but you’ll have to scroll down to see them. All in all, the control panel covers all your basics, but it would be useful to have few more options already integrated, instead of browsing for them on MOJO marketplace. There is no limit to the number of email accounts you can have, but you’ll only be allotted 500 MB for each account. It took us a second to find the section for creating a new email. After that, we were told that we’d have to wait 20 minutes for the creation of our mailbox. Hmm. We didn’t listen and tried to log in immediately, which worked. We’re not sure why we received that message. Your webmail client choices are Open-Xchange, SquirrelMail or AtMail. Setting up your website is easy and you can do it in many ways. If you have an existing site elsewhere, there’s no charge to transfer it. If you’re starting from scratch, you can upload everything via FTP, but for future tinkering, keep in mind that there is no SSH, at least in the cheapest plan. If you are more of an online building type, you can drag and drop elements in Weebly. However, if you want to explore more, or add and/or pay, you can browse through the MOJO marketplace. Omnipresent WordPress is found everywhere, and FatCow is no exception. However, that’s all there is for content management. You will also have WebSite Creator by CM4all and Weebly for building your website and goMobi Site Builder for your mobile needs. Sure, those are big names that are widely used and they will surely work everywhere. However, sometimes it’s nice to have more choice. Luckily, there is the MOJO Marketplace, so you can explore other options there. Joomla, Concrete5 or Drupal are at the tip of your fingers. When it comes to uptime, Fatcow delivers the goods. Our relatively short Uptimerobot test showed that the uptime was 99.98 percent. The only downtime was about two minutes long. Although that should not happen often, it is not a deal breaker at this rate. FatCow passed uptime testing with flying colors. Our server was located on the East Coast, in Burlington, Massachusetts. Considering that, you would expect that the EastCoast response would be lighting fast. It wasn’t. The best response time at Ashburn, Virginia was 0.6 seconds, but it would often spike to 1.5 seconds. The response line looked more like an EKG flatline, which is not good. However, that characteristic was shared among all other tests. Portland and Palo Alto had an average load time of between 1 and 2 seconds, but it was difficult to average the response times because of inconsistencies and extreme values. Keep in mind that these are an average of the best results. Portland once had an average response time of 1 second, but the next time it spiked up to 6 seconds. International waters brought with them international problems. The ups and downs were still present and making an average out of one test was a problem. Although Tokyo had an average response of about 3 seconds, it also had the worst response in all of our tests, at almost 12 seconds. Sao Paulo, on the other hand, was on par with U.S. West Coast, at 1.5 seconds, on average. (Which, frankly does not paint a nice picture for U.S. response times. Dublin had an average of 2 seconds with frequent periods of 6 seconds. You get the picture. Inconsistency, thy name is FatCow’s server loading response time. When it comes to help and support, there are ups and downs. FatCow makes all possible avenues of getting official help available, including: telephone, chat, tickets and a knowledge base. But there was no sign of formal community support. The good thing is that the official support will do their job and you will solve your problems. The big downside is that the wait time is long. Expect a wait of 12 minutes, on average, if you use chat help, the most commonly used form of support. And the company doesn’t provide an estimate of how long are you going to wait. In fact, the worst case scenario we experienced was when the problem was resolved in 10 minutes, but the wait time was 20 minutes. Only one word for their Moo Crew: yikes. An additional email request to rate staff performance doesn’t leave us with the feeling they value our time. Given the long wait times, combined with the absence of community support, we feel FatCow’s support system could do with some beefing up. FatCow offers a ton of limited-time discounts. They also offer discounts that are tiered by the number of years you pay on an annual, rather than monthly, basis. Discounts vary and you can’t see all the details unless you dig through their fine print. It’s worth your time to do this as discounts can range from 20 percent to 60 percent. Please Note: The prices provided here are the regular, non-discounted monthly rates. Check the FatCow website for current offers. FatCow is a provider that you hate to love, love to hate or want to see do better. Having said that, there’s a lot more to say about this host that’s stayed alive and kicking for over 15 years. They jumped on dedicated and VPS hosting plans a bit late in the process (2014, to be exact) but they landed with an assortment of worthwhile plans. Daily backup, combined with really good uptime, and stirred with a hint of humour is a great mix for good hosting time. Being eco-friendly and operating on 100 percent wind power is a huge bonus, too. However, not everything is sunshine and green pastures. Two major let downs are support and loading times. Although there’s a big knowledge base, there are no official community help pages. Waiting times on chat support are far longer than the industry average and they don’t warn you how long your wait might take.The loading times are nothing to brag about and the response was rarely consistent. In the end, this puts FatCow in a neutral zone. They aren’t what they used to be—both good and bad. So if it seems like it might be a good fit for you, test out FatCow. But remember, with a website that’s filled with milky puns, there will always be a few people who are lactose intolerant.